Nick Blackburn has a career record of 11-14 against teams below .500 with a 4.17 ERA. Blackburn’s career record against the Kansas City Royals is 1-2 with a 4.59 ERA. This season, however, Blackburn has yet to earn a decision against the Royals in two starts. In those two starts, Blackburn has a 9.64 ERA, giving up 10 earned runs in 9.1 innings, with only three strikeouts. The Twins, amazingly, have won both of Blackburn’s starts against KC. The first Twins to go on the DL during the regular season are 3B Nick Punto (right hip flexor) and RP Jose Mijares (blurred vision/left elbow), who were placed on the 15-day DL on April 16th. Punto is hitting .269 in nine games, and Mijares has a 6.00 ERA in five trips out of the bullpen. They join RP Clay Condrey (strained right elbow), RP Joe Nathan (right elbow surgery), and C Jose Morales (right wrist surgery) on the DL. Slugger Jim Thome homered again this week in an 8-3 victory over Kansas City. Thome is now only six home runs away from tying Twins legend Harmon Killebrew with 573 home runs. But before Thome catches Killebrew, he will need only two more to tie Rafael Palmeiro for 11th on the all-time list. After finding themselves in down 4-0 to the Royals last Saturday, the Twins clawed back to take tie the game at 6-6. 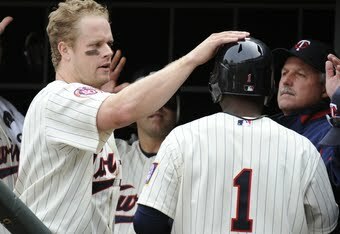 The score remained tied until the top of the eleventh, when Orlando Hudson scored on a Michael Cuddyer sacrifice fly. Hudson had reached on an error by Billy Butler. Jon Rauch came in to close it out, but back to back hits by Billy Butler and Jose Guillen tied the game at seven apiece with Guillen at second base and nobody out. Rauch got Alberto Callaspo (.411, 2 HR, 6 RBI vs MIN in 2010) and Mitch Maier to fly out, walked Jason Kendall, then got Alex Gordon to ground to Orlando Hudson. After KC’s Rob Tejada loaded the bases (Delmon Young doubled, JJ Hardy walked, and Alexi Cassila singled), Denard Span hit a Texas Leaguer that fell behind Callaspo, scoring Young and advancing the runners. Hardy then scored on a Joe Mauer sacrifice fly. Rauch faced four men in the bottom of the twelfth to record the win. The Twins starting staff’s ERA was 8.08 this week, and teams are beginning to see a weakness in the 2010 Minnesota Twins. The starting rotation's ERA is 10.41 without Liriano's stats. Liriano tied for league lead in ERA with...Andy Pettite?!? Last season, Francisco Liriano’s ERA was never under 5.09, was 0-4 in five starts April, recorded only 11 strikeouts in his first three starts, and finished April with a 6.04 ERA. In 2010, however Liriano’s is 2-0, the Twins are 3-0 in games he has started, has recorded 17 strikeouts, hasn’t given up a run in his last 15.1 innings, and is tied for the American League lead in ERA with 40-year old Andy Pettite at 1.29. How good ARE the Twins? The Twins are 13-6 and have the second-best record in the American League, behind Tampa Bay’s 14-5. However, they have yet to play a team with a record over .500. The Twins face their first winning ballclub when they face Detroit this week. Detroit is 10-9 and in second place in the AL Central. The Twins have won their first six series of the year (Boston, Los Angeles, Kansas City, Chicago, Cleveland, Kansas City), but have failed to sweep any of them. The Twins have lost one game in each series so far.